I truly think the meaning of perseverance at it’s true essence is to resolve to never give up regardless of what happens. No matter how much of a beating you take. Resolving to never throw in the towel. Never going down without a fight. And getting back up time and time again. Until you cross the finish line. It is being in it for the long haul. Until the job gets done. Plain and simple, it is failing our way forward without quitting. Showing up, day in and day out. Regardless of how great or bad you feel. Showing up and getting the job done. Eliminating failure from being a possibility. This is my own definition of perseverance. I feel as if what perseverance is is that it is a winners quality. We can be winners in our daily lives by utilizing this one human attribute that we were all actually blessed with. It is just how much we tap into that we can harness the power of it. And the more we use it, the more we see the power of it and how far it can truly take us. Steadfastness is a great word for what perseverance is. It is taking an unwavering approach that is constant and committed. It is in a sense like a heat seeking missile that will stop at nothing to reach it’s goal. A heat seeking missile rarely takes a straight path towards it’s target. It corrects it’s path over and over until it finally makes its way to it’s target and destructs it, getting it’s goal. Perseverance has a quality of self-sacrifice to it as well. When it comes down to it, we must sacrifice much of ourselves when we are persevering towards something or for someone. If we are trying to build our business, we are sacrificing time and energy that we can be using to have fun or spend with our loved ones. If we are persevering towards getting a degree, we are sacrificing time and energy we could be using in the job field already making money. But we use perseverance because we see a better future. And perseverance is the best suited vehicle to get us to that other side of the fence. Where the grass is always greener. It is like a fighter in the ring who will simply not give up. Even when he/she is taking a beating of a lifetime. Even when they get knocked to the ground and are near going unconscious. They are still trying to get up and throw more blows at their opponent. This is what perseverance is. It is the mother who works 3 jobs and comes home to cook their children food. Even when she is incredibly tired and knows she has to do it the next day. It is a dog who will not stop chewing through a bone until that baby is in the dogs stomach! “Gone With The Wind was rejected by 38 publishers. Colonel Sanders recipe was rejected 1009 times before the recipe was taken on! The ultimate example of perseverance. The Boston Red Sox being down 3 games to nothing in the championship series, know no team in the history of baseball has ever came back from this. And the ended up fighting regardless and going on to win not only 4 games in a row for a series win. But also winning 4 straight games in the world series. Making them champions of the world. It is rapper Eminem battling his way to super stardom after being laughed off stage countless times and told he would never make it in a predominately black industry as a white man. I saw in an interview where he said that it didn’t matter what got in his way, he was going to make it. Starbucks owner Howard Schultz was rejected by over 200 banks for which he went to to try to get a loan to start Starbucks. The authors of Chicken Soup For The Soul were rejected by 144 different publishers. Now they have done over a billion dollars in revenue and will only go up from there. Walt Disney was turned down 302 times for investment for Disneyland. Thomas Edison refusing to give up after thousands of times of failing to create the light bulb, yet kept going and now we all live in a world full of light. It is Jack Ma, the owner of Alibaba which is he one of the biggest companies in China. Who before amassing his 40+ Billion dollar fortune, was rejected from 30 different jobs, one of which included KFC. He also talks about how he was denied being accepted into Harvard 10 times. It is the grit and fight in a running back who breaks tackle after tackle after a long game, working his way to the end zone. Morgan Freeman worked as an actor for decades before becoming an A List star and commanding millions of dollars per film. It is a baseball team and their team members playing their hardest and best even win they know they have already been eliminated from the opportunity of reaching the playoffs. Noah taking 120 years to build the Ark, all of which was a project in which he had no clue if the world would really flood. It is Manteo Mitchell, the Olympic relay runner in which broke his leg while running, and knew it, but kept running and finished the race anyways. He said that it “hurt so bad, but he didn’t want to let the three guys down”. I think our last example of perseverance says it best. That even though this man broke his leg, he wanted to finish. Not just for himself, but for his team. This is often when we are able to utilize perseverance the most. When we have someone else we are doing it for. This is because human beings find more meaning and energy in their lives when we do things for other people. For some reason there is more energy available to us and we are able to persevere more efficiently when we are doing something for others. Even if it is our passion, if we want to “make it” for our family, we will we less likely to throw in the towel when times get tough. 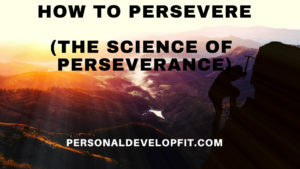 When it comes down to how to persevere, I think the first thing we need to do is make sure we love someone thing enough to stick it out until you reach your goals and even greatness. If we don’t have enough passion in something, we will never have enough internal motivation to persevere through the tough times. So when it comes down to it, loving or caring about something enough, deep within your soul, will allow you to find something WORTH persevering for. Steve Jobs talks about his and talks about how finding something your passionate about is a must when it comes to starting a business. Because we are only human and when things get tough and we don’t love something enough, we will usually quit. Often times we go into things we are excited about and give 110 percent of our energy to it right out of the gate. Now this is admirable and can often get you going, but we are all human and we are going to hit a wall when we are going at this pace. We cannot keep up a sprint during a marathon. Even Usain Bolt couldn’t even manage this feat! The same mindset has to be taken when we are going into things we need to persevere in. Society has been primed to want the fastest solution. The easiest diet. The get rich quick. We have all bought into them and the only thing that comes out of it is frustration. You and I need to learn to see things as a marathon. We need to steadily chip away and put in consistent daily effort in order to persevere towards and to our goals. I mean it took two years of constant work for Michelangelo to sculpt the statue of David where he never lost enthusiasm. Which Michelangelo etched himself down in history of creating one of the most beautiful and word renowned statues every known to man. That is the power of perseverance! By taking stead action daily we put ourselves on the sides of the angels as personal development author Brian Tracy says. If we take this approach, we look at it as more manageable. We don’t get overwhelmed by how BIG the task may look. We just say to ourselves ” One day at a time”. This quote is the essence of perseverance. We build a wall one brick at a time. We don’t try to resurrect the wall all at once. We lay the brick, then the next brick and then the next brick. Then after a while, we see great progress, which gives us motivation to move forward. Which after a few of these realization of how far we come, we then get to the last brick we have to lay and then we look up and see the wall we have worked on so hard and consistently. If you are familiar with the story about a miner in the 1800’s who found gold and went out and bought a machine to start mining the gold from the vein he found. He mined a lot of it and then the vein ran out and so did his drive to keep searching. What he didn’t know was that if he just went over a couple feet more, he would have found another massive vein of gold and profited from it massively. Instead he sold his equipment for a man for a few hundred dollars, in which he was just happy to get his money back that he spend for the equipment. well the same guy went back and ended up mining the vein of gold that the guy before had believed ran out. The second one reaped the riches beyond anyone’s imagination. This is what happens to us often times in life. We are so close to a victory, or at least a lucky break that can give us hope to keep going. But we give up too soon. We put a time limit on our victory and if we don’t get it in that time frame, we throw in the towel. But often times we are so damn close and if we just keep going, we will get that lucky break. Even if we don’t, at least we know that we died trying. Instead of giving up and living as a failure. Success isn’t guaranteed to anyone. But the chances of success are so much greater if we just keep persevering. So resolve to make the decision today to realize that you may just one day away from that big break. Keep that in the front of your mind as your motivator to keep going. And that day will come for you my friend. There is light at the end of the tunnel. No matter how long that tunnel may seem to be. Always go back to WHY. Why did you start doing something. When you found out a reason why you started doing something and started to do so, you ignited a fire in you. Sometimes we lose that fire and we need to remind ourselves why we started. To get back that feeling that gave us enough courage and energy to forge forward. When you are down and out, remind yourself why you began. And this can help you persevere and better yet, finish. No matter what price you have to pay. Decide to pay it. You have a debt and you have to get up every day to pay that sucker off. Put in the work. By knowing the debt we have, we can create a payment plan. The same is true with what we are persevering towards. Once you know the price, you just have to make your daily and monthly payments. This can be working a little extra, sleeping a little less, hiring extra people, getting a mentor, having a friend to talk to about rough times. Just know what you need to pay the ultimate price. And then map it out and take part in whatever it takes to pay that price. Do this daily until you persevere to the end goal. People who give up to easy, or don’t even get started at all, take on the mindset of “Why should I try if it isn’t guaranteed?”. Nothing in life is guaranteed. So you and I need to take the mindset that it doesn’t matter. Sure it isn’t guaranteed that we will get the outcome we desire. But we can’t let this fact get in the way of us persevering towards what we want and need out of life. Otherwise if we do, the only thing guaranteed is us giving up or never even starting. Any excuse your mind gives you trying to sabotage you from moving forward needs to be ignored. There are so many fears that our minds project on us. They are ultimately trying to keep us from safe. We have them because we are scared of failure and also scared of success. So we take some action, but if we take too much action, then we may be overwhelmed with all the success and admiration that comes from it. Or we feel like if we become to successful, we may lose it all and look like a fool. There are so many fears can act as roadblocks that get in the way of our ability to persevere. Simply ignore them and keep moving forward. This will keep us from being our own worst enemies and become are best foes instead. In order for us to persevere through the tough times, we need to be able to find some sort of meaning. Taking on the philosophy that everything happens for a reason. This mindset will help us break through barriers that we are facing. If you and I don’t trying to find meaning and positivity in every adversity, then we will become discouraged. And ultimately end up quitting. Human beings like to feel as if they are destined for something great. And it is absolutely true. We just need to learn to find meaning on our way to our destiny. Otherwise we will never make it there. The best way to do this is to reflect back on when we overcome something more tough. To show us that we can and will persevere through it. As we have faced pain before and come out on the other side. This will prime your mind for success in the next step. Which is to then to actively search and finding positivity in the current dilemma. If we look long and hard enough, we can find something positive! People that persevere to the degree that it takes to reach their goals are incredible goal oriented. No matter what you are working towards persevering towards, keep the goal in mind. Write your goals out day in and day out. In the morning and in the evening. State them aloud. Whether it is something positive like you want to make 100K this year. Or that you are unemployed and have the goal of having a new job within the next 2 weeks. Always keep your goals in the forefront of your mind. This will ingrain them into your subconscious mind after you keep this up. It will keep you on track as you will be holding yourself accountable. No one does it alone my friends. So don’t try to do so. The most persevering people have people around them that are there for them and vice versa. Through the likes of things like forming mastermind groups. They either meet up or text with people often that are good support anchors in their lives. People that are there to provide verbal and emotional support. Persevering personalities know that times get rough and people start to feel like they are in it all alone. And know that they need positive people in their lives to turn to in order to get encouragement to keep going and persevere. At the end of the day, when it comes to perseverance, it all lies in the mind. The longevity of persevering ways can be dramatically halted or pushed from behind. Depending on our states of mind. Persevering personalities catch their mind when it tells them that they can’t do something. Or that they should quit because it just isn’t worth it. They see it and quickly state the opposite. They know that the power of the mind can be used to help them. And they don’t believe their mind when it tells them to quit. They hear it and then quickly dismiss or let go of the thought. People who give up allow their mind to dictate their actions. So the more you and I master our minds, the easier it will be for us to use the incredible power of perseverance and milk it for all it is worth. Some of the people we admire most are those that can laugh at themselves. That don’t take themselves or life more serious than they need to. This is a personality trait that you and I need to make prevalent in our lives in order to be a true persevering personality. If we take things to serious, we build up too much pressure and stress. It brews and brews until we explode. We reach our breaking point and give up. Or cause a lot of damage from blowing up and have to start over again. It can affect our physical, mental and emotional health if we can’t integrate enough humor on our journey. So remember when times are tough. When you are trying so hard to build that business but not seeing results yet. When you are study relentlessly but unsure if you will do well on your exams. When your pursuing your dream job, but aren’t getting calls back from employers. Simply laugh at it. Find humor in it and in your life. Humor heals the soul and lightens stressful moods. It is a natural xanax and anti-depressant. It can make us transcend the world temporarily. Let’s us it often on our journey to persevering towards our goals and dreams! Persevering people expect nothing in life to be handed to them. They don’t look for handouts or expect people to help them. They go out and get theirs. If there isn’t a way, they make a way. The cultivate the spirit of a survivor. They will make it regardless of what their circumstances are. So you and I need to solely rely on ourselves. We need to become solution creators and know that every problem that we encounter can be solved. That it isn’t the end of the road. Just a road block. I’m not saying don’t take help from anyone. Not at all. Just don’t expect it. Move forward in a self made way. Earning every stripe. This will allow you to be the pilot of your plane, instead of just a passenger whose destination is dictated by the pilot. When we are in victim mood, we are waiting around for others to take action for us or show us the way. The ultimate form of perseverance is making the way, even when there seems to be no way at all. You work on finding a way until you discover it. No waiting around. They also act as if they still need to grind. Even when they don’t need to as much. They know that in order to keep a powerful persevering spirit, they need to always keep at it. Always striving. Acting like they are still climbing the mountain. Even when they have reached the summit that they sought out. Often times we fail to persist and persevere because of what people say about us or our goals. We want to start our own business, but people tell you there is no money in the field you want to start it in. You want to become a real estate agent, but people say the market is bad. These people are just speaking out of a lack mindset because they believe they could never do it. Never listen to anyone who says things like this. Allow it to just make you drive harder towards yours goals. in order to persevere, we cannot let anyone tell us it can’t be done or advise us not to do so. Because is we do so, we are missing out on an opportunity of a lifetime. Literally. “The difference between a successful person and other is not a lack of strength, not a lack of knowledge, but a rather a lack in will.” – Vince Lombardi Jr.
“Perseverance – Whether a pebble or mountain, climb over your obstacles with determination and dignity.” – R.H. Cornish P.s. “You are an arrow on the path to greatness. Let the winders nor the rains alter your course. Persevere to make your aim stay true.